Rustle up some eerie looking edibles for your Fall party this year. Here's plenty of chilling and creepy yet easy ideas for decorating some themed Halloween cupcakes in an easy step by step format. Included are ideas for quick and easy to make spider, witch, zombie, eyeball, alien, chocolate orange creepy cakes and more. All these terrifying treats are nice and easy to make but look hauntingly good for any spooktacular party or event. Even if you can't cook, then cheat. Buy some ready-made chocolate cupcakes and use the ideas on this page to decorate them up in style. No one needs to know that you didn't make them right from scratch. Here's 7 quick and easy Halloween cupcake ideas with instructions on how to decorate. All cupcake instructions on this page assume that you already have bought or made some plain cupcakes ready to decorate into Halloween themed designs. AllRecipes is a great site to get instructions from if you don't already have your own favorite recipes. Alternatively, use a ready made packet mix which makes it so easy to make your own. 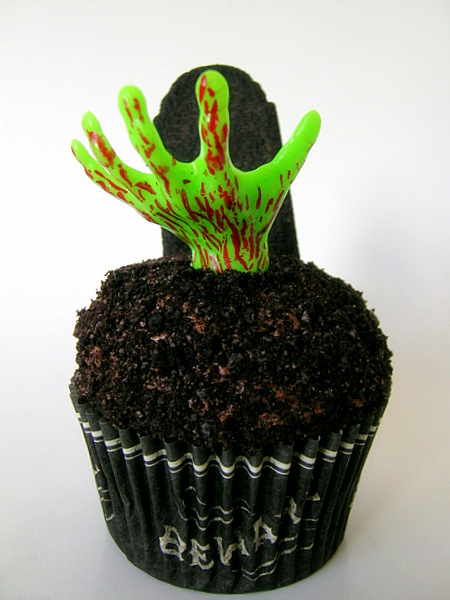 Green zombie hand planted in a chocolate cupcake with a tombstone behind. It's rising from the dead. Great for zombie themed Halloween parties. Here's how you can easily whip up some fantastic little easy Halloween cupcake designs based on these creepy undead zombie creatures. 1) Once you've baked your cakes and they have cooled down, they're ready to decorate. 2) Add some silky smooth chocolate frosting or icing on top. I just use a regular table knife to spread my frosting on thickly. It doesn't need to be smooth as you won't actually see the buttercream once on top of the cake. 3) Coat the buttercream frosting with grated chocolate. You can use chocolate shavings or crushed dark cookies like Oreos in order to make the cupcake topping look like dirt. I achieve this effect by placing lots of grated chocolate in a bowl and then turning the cupcake upside down and dipping it into the chocolate. Sprinkle more on top with your fingers to cover any bare areas. 4) Stick a hand shape topper or pick in the middle. If your hands are not edible ones, do make this clear to whoever is going to be eating your delicious treats. 5) Place in a nice coordinating wrapper like a green wrapper or one decorated with zombies. 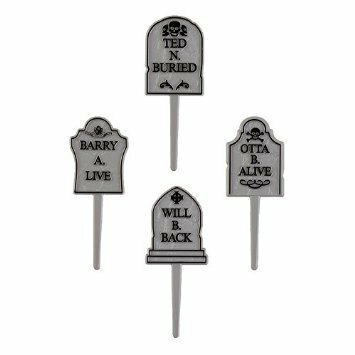 Add in any other decorations like a cookie tombstone or candy bones and you're good to go. 🎃 Find more detailed instructions for making these cakes including other zombie ideas on my complete Zombie Cupcakes Page. 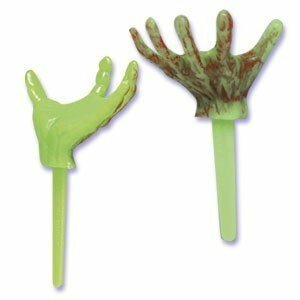 Not edible, but how cool to have some grungy green zombie hands coming right out of your creepy cupcakes! Or what about some glow in the dark zombie characters, eugh! As with all non-edible items, please take care that your guests don't try to eat them and please take extra care with inquisitive babies and preschoolers who tend to put anything in their mouths. Also look out for some gory body part pops. You can use these either as candy favors or as quick and easy edible decorations for the tops of your cakes. Simply cut the sticks down to the desired size and stick in the top. Easy Halloween eyeball cupcakes which are quick and easy to make but look creepy with eyes staring right at you. 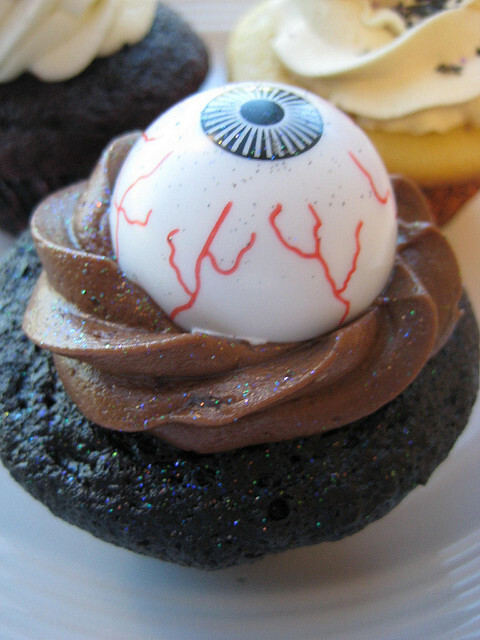 Here's how you can easily whip up some fantastic looking eerie eyeball treats that are almost too gross to eat. Your guests may be creeped out by the fact that they seem to watch you wherever you go. 1) Once you've baked your cupcakes and they have cooled down, they're ready to decorate. 2) Add some chocolate buttercream frosting or icing on top. If you can pipe the frosting on then this will look better, otherwise spread the frosting on thickly on with a table knife. 3) Add your eyeball firmly in the middle of your cupcake frosting. 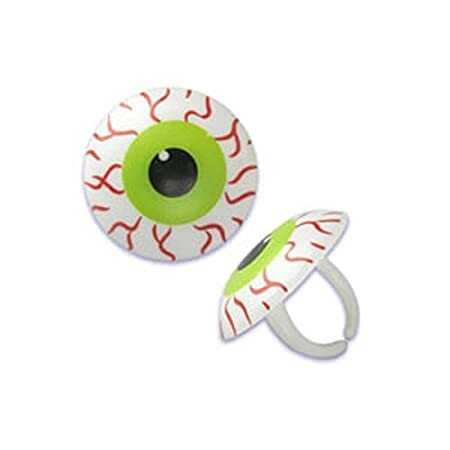 You can get eyeball candy including gummy eyeballs, chocolate ones, lollipops and gumballs. If your eyeballs are not edible, do make this clear to whoever is eating your finished treats. 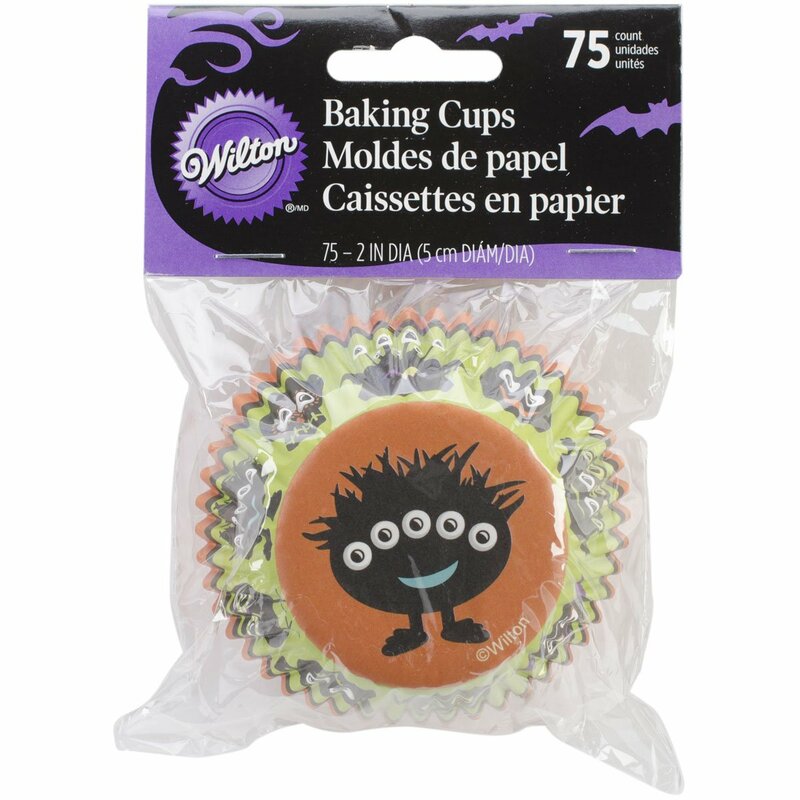 5) Place the cupcakes in a Halloween wrapper, add in any other decorations and you're good to go! 🎃 Find more detailed information on making these on my Eyeball Cupcakes Page. I love the idea of Glow in the Dark eyeballs for your eyeball cupcakes. 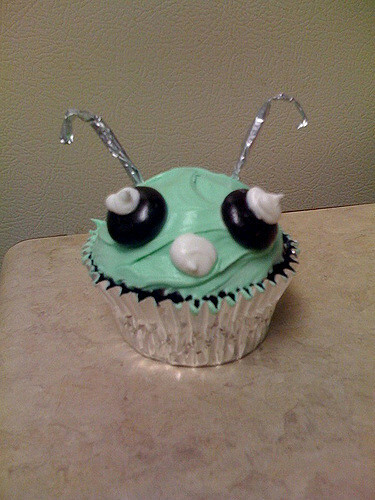 Not edible, but how cool to have glow in the dark eerie eyeballs right in the middle of your creepy Halloween cupcakes. If you use any non-edible items, please take care that your guests don't try and eat them. Please take extra care with inquisitive babies and preschoolers who tend to put anything in their mouths as these could be a choking hazard for young children. 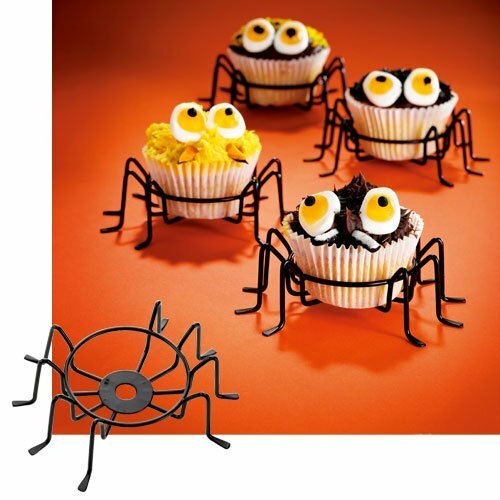 The long red licorice legs and beady red eyes make these spider cupcake designs look very creepy. Here's how you can easily whip up some fantastic evil looking spider treats yourself. 2) Add some chocolate buttercream frosting or icing on top. I use a table knife to spread mine on thickly. It doesn't need to be smooth as you won't see much of the buttercream. 3) Coat the buttercream with chocolate sprinkles or chocolate shavings to make it look like a hairy, brown spider. I do this by placing lots of sprinkles in a bowl and then turning the cupcake upside down and dipping it into the sprinkles. Carefully drop more on top with your fingers to cover any bare parts. 4) Add in 2 jelly beans to look like spider eyes. Red or green jelly beans look nice and evil for Halloween. 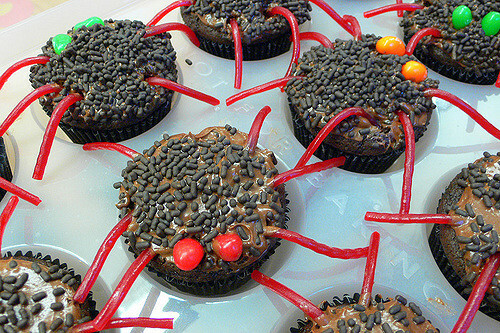 5) Cut 8 licorice laces or twists and stick them around the cupcake to look like spider legs. If you can't get the licorice to bend then keep the pieces short so they just stick out a little way from the cupcake. The red string-like licorice makes very good and evil looking spider legs. 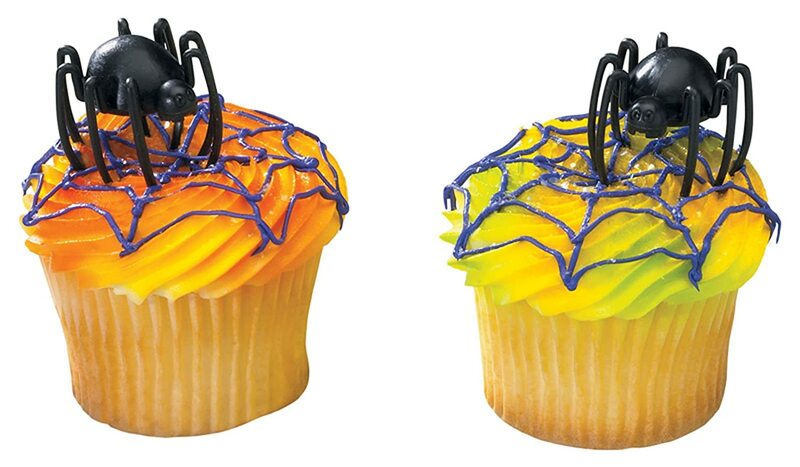 6) Place these in a matching cupcake wrapper, you can get spider themed wrappers and liners to use. I like the spiderweb designs that you can get. Add in any other decorations to finish these off. 🎃 See my Spider Cupcakes Page for more ideas on using this theme for your Halloween baking. If you're doing a witch or wizard theme for Halloween, perhaps having a bit of a Harry Potter theme, these witch hat cupcakes would be just magical. Here's how you can easily stir up some bewitching looking witch hat cakes for this October 31st. 1) Once you've baked your cakes and they have cooled down, they are then ready to decorate. 2) The main section with the witch's or wizard's hat is made from a mini meringue. You dip the mini meringue in melted chocolate. You may need to check what size the meringue shells are so you can get an idea of how they will look on the top of a standard cupcake. I like to melt chocolate in the microwave. Place the chocolate into a microwave proof bowl and heat for a maximum of 30 seconds. If the chocolate hasn't melted, put it on for another 10 seconds and check. Keep zapping for 10 seconds and then checking until the chocolate has melted. Chocolate can burn pretty easily if you microwave it for too long, so that's why it's best to check often. You can also heat up a quarter filled saucepan of water on the stove. Place a heatproof bowl with the chocolate over the top of the saucepan . You might want to try the bowl out for how it fits over the saucepan before you start. Keep slowly stirring the chocolate until it all melts. 4) Once you have melted your chocolate, dip your mini meringues into the bowl. Make sure to cover all the sides and top of the meringues with chocolate. Just leave the base clear so that you can place the meringue down onto baking paper, a plate or a wipe-clean placemat until the chocolate sets. 5) Once the chocolate has hardened, add on some candy stars to the witch's hat. You can stick these in place with some small blobs of melted chocolate. Cocktail sticks or wooden toothpicks are useful tools for adding the melted chocolate where you need it. 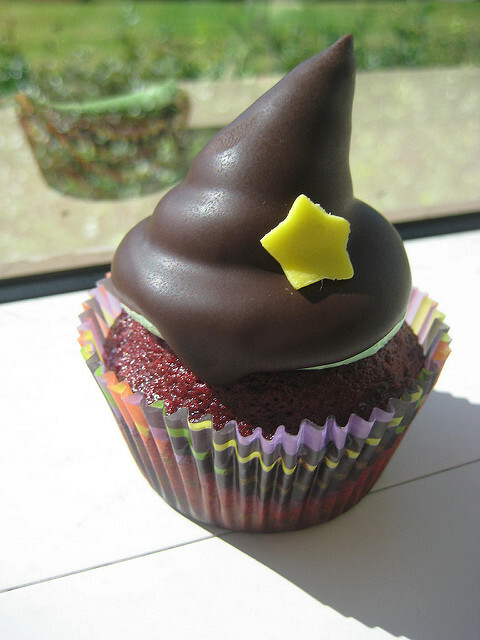 Use Stars as ideal decoration for some truly magical wizard or witch hat cupcake designs. 6) Stick the witch's hat to the top of your cake with a small amount of buttercream or melted chocolate. 7) Place these in a themed wrapper or liner. Add in any other decorations and you're done. These spiderweb cupcakes are super quick and easy to make using a spider topper to create most of the decoration. Here's how you can easily spin some super spiderweb designs very quickly. 1) Once you've baked your cakes and they are cool, you are ready to decorate them. 2) Although the image shows white buttercream, I would use a brown chocolate frosting with white icing for the spiderweb because I think this would look look even better. Add some chocolate buttercream frosting or icing on top. I use a table knife to spread mine on thickly. Try to smooth out the topping with the back of a small spoon. This will help the spiderweb design show up more. 3) Use a ready made icing tube or your own fine white icing to pipe on 4 or 5 circles inside each other. Aim for the look of tree rings on the inside of a stump. 4) Grab a toothpick and draw a straight line from the middle of all the circles to near the edge of the cupcake. Use this same process to add in several lines which start in the middle and end up working their way around the circle. You will end up with something that looks like a spiderweb. You can see this spiderweb icing process with this video on youtube at roughly 2:48 mins into the video shown below. 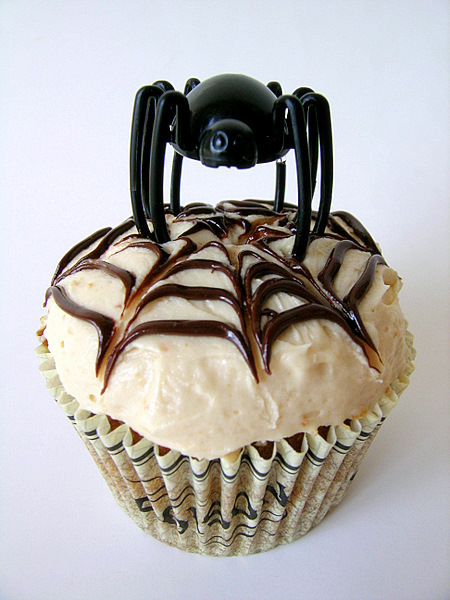 5) Stick a black spider cupcake topper right in the middle of the spiderweb. If your spider is not edible, do make this clear to whoever is eating your scary treats. 6) Place in a themed wrapper like one with a web design, add in any other details and you've finished. Not edible, but how cool to have glow in the dark spiders right in the middle of your creepy designs. As with all non-edible items, please take care that your guests don't try and eat these. Please take extra care with inquisitive babies and preschoolers who tend to put anything in their mouths as these could be a choking hazard for young children. Alien's have landed. They're out of this world! Here's how you can easily make some scary space alien cupcake designs of your own. 1) Make sure to let your cupcakes cool down after baking. If you are using store bought designs, they should be ready to go. 2) Add on some mint buttercream frosting or green icing on top. I use a table knife to spread mine on thickly. Try to smooth it out a little with the back of a teaspoon. 3) Use some round sweets like smarties or chocolate buttons to make the eyes and add a blob of some white icing from a tube in the middle of each alien eye. Also make a nose with the white icing. 4) Wrap 2 cocktail sticks, or wooden toothpicks, with silver foil to make alien antennae. Stick two of those in the cupcake. Do make it clear to whoever is eating your cupcakes that these are not edible. 5) These alien designs look especially good placed in silver baking cups or a metallic foil wrapper. Aliens look good in foil cups. It looks like the Alien is sitting in a little spacecraft of his own. Add in any other decorations to finish. Special thanks to Melissa for a great recipe idea. You'll really Fall for these. Here's how you can easily whip up some beautiful chocolate orange autumnal designs. 1) Once you've baked your chocolate cupcakes and they have cooled down, they're ready to decorate. 2) Add some orange buttercream frosting or icing on top. 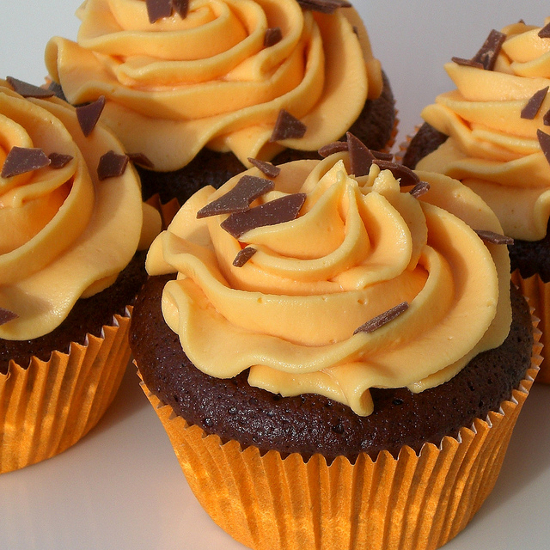 If your orange buttercream doesn't look orange enough, add in some orange food coloring. This looks good if you can pipe on the buttercream into a swirl or just spread it on with an eating knife. 3) Sprinkle some grated chocolate, chocolate shavings or chocolate sprinkles, over the orange buttercream. 4) Place them in a nice orange color baking cup or wrapper. Then add in any other Fall or Halloween decorations to finish off. Which of these Quick and Easy Halloween Cupcake Ideas is best?